We require that minors under the age of 18 years provide government ID, or equivalent. and be with their parent or legal guardian with matching ID. Siblings or relatives are not considered legal guardians without government documentation. Parent participation is encouraged! Bringing health, safety and knowledge to the industry is what we do. We are here to help guide you and yours through the process with confidence, not assist minors with making rash lifetime decisions. Prior to all procedures you will receive appropriate aftercare for the piercing site, choices and recommendations of jewelry and will then complete a paper-free digital release form. Westcoast Piercing and Ink is one of the few establishments in BC that provides a completely sterile procedure. This means that not only are the needles and jewelry sterile, but so is every aspect of the procedure. • All procedures are performed by a skilled piercer, wearing a fresh pair of nitrile gloves, ensuring the piercing site is clean and germ free by cleansing the area with an alcohol pad. • The piercing site is examined and marked for best placement, then iodine is applied to keep the area free of germs. • Following your visual approval of the marks, the piercer removes all disposables (qtips, cleanser, paper towel, mouthwash) from the tray and discards them along with his/her gloves. Now the piercer is ready for the sterile setup. The sterile setup includes: 3 ply tray liner, qtips, lubricant, nitrile gloves, paper towel, clamps, receiving tube, needle, taper and jewellery. All needles are single use and are available from 19ga – 4ga. Most piercings are completed in 1 to 3 seconds. Our goal is to provide the quickest and most comfortable procedure, using various techniques and positioning, while maintaining a completely sterile environment. All non-oral piercings are gently soothed by blotting Sunshine Mist after completion of the piercing. If the piercee is allergic to Sunshine Mist a Sterile Saline wipe may be used. Some bleeding may occur depending on the site and the gauge size, in which case more sterile qtips will be used. The piercer will then examine and approve the piercing with you, and proceed to clear his/her tray of disposables, spray reusable instruments with an enzymatic foam and discard the needle in the appropriate sharps container. The piercing area is then thoroughly wiped down with a bleach solution. Your piercer will answer any questions or concerns you may have about any piercing site free of charge. 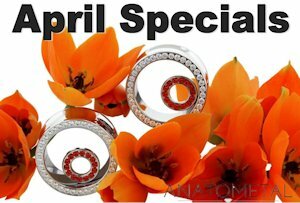 We are here to help to promote happy healthy piercings! Branding is defined as marking the body with heat. People have been branded for thousands of years as symbols of love, property or ownership, members of risqué clubs and gangs. Every person has their own reason for being branded. The outcome from branding will differ from person to person, as it is an organic modification, rather than an exact one like tattoos or piercing. Results will also differ with location, skin type, body fat, care, etc. For many, the reason for branding focus is based more on the actual experience, rather than on the end results. Fire Direct is attained by allowing Tibetan incense, pine needles or moxa to burn into the skin. It leaves deep distinctive circles approximately 2-4 times larger than the incense. During the process, expect a slow heat sensation with a superbly ritualistic transcending feeling as the incense gains more heat and then drops off. Many have said that it has put them into a deep trance. This is the process of using red hot metal pieces, pressed into the skin repeatedly to form a design. It has the possibility of sharp deep initial trenches from each strike. Initial lines can be straight or curved, up to 1” long and will appear approx. 2mm-3mm wide that will heal to approx. 6mm-8mm wide. This method requires careful planning to execute more intricate designs. Multi-strike is a flash of intense heat that subsides very quickly but can create a hypnotic trance-like feeling with larger applications, often accompanied by soothing rhythmic sounds. This branding technique is far less primitive. It is the use of a medical cautery unit. Essentially it is a pen that has a tip that heats up, and is used to literally draw the branding on. It is the best method for finer more detailed designs but generally not as deep as strike brands. Initial lines will be 1mm-3mm and heal to 2mm-5mm wide. The designs are done in passes of up to 1” at a time. The sensation of Cautery branding is similar to a tattoo or a 5 minute Fire Direct sitting done in 5 seconds. It is typically not as conducive to ritual as strike or fire direct branding. The guidelines and information contained on this site are based on our professional experience, common sense, research and extensive clinical practice. Our team will help to provide advice on any questions or concerns you may have. This is not to be considered a substitute for medical advice from a doctor. If you suspect an infection, seek medical attention. Please note that all items and prices may alter or change without prior notice and are subject to availability. All gold products are hand-crafted therefore all sizes quoted are as accurate as possible. Some sizing may slightly vary due to polishing a soft malleable metal. 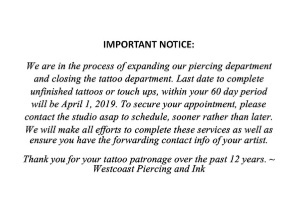 WestcoastPiercing.com cannot be held responsible for any misunderstandings which may arise from the content of this website or links to associated websites. WestcoastPiercing.com is a registered trademark. All rights reserved. Under no circumstances may the contents of this website be reprinted, or reproduced or utilized in any form or by electronic, mechanical or other means, now known or hereafter invented, including photocopying and recording, or in any information storage and retrieval system, without permission in writing from WestcoastPiercing.com. 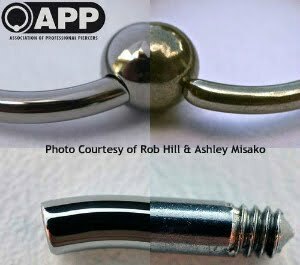 Great care has been taken in compiling this website and accordingly, WestcoastPiercing.com disclaims any liability for errors omissions or inaccuracies contained within.